Timber transportation service providers carry out driver training to provide a high-quality and efficient service (economic and safe driving, assessment of the size and quality of timber, etc.). For JSC “Latvia’s State Forests” (LVM) a professional, competent, knowledgeable driver means a better quality service – a forestry forwarder driver is familiar with all the requirements of the company, both general and specific labour and environmental protection requirements, as well as the requirements concerning various certifications. Such drivers know both the most efficient, accurate working techniques, as well as how to handle specific situations without incurring additional losses or costs. In turn, for a carrier, a professional driver means lower fuel and technical park repair costs, faster and more accurate loading of cargo to be transported and more accurate determination of the amount of timber loaded. The driver’s ability to act and make decisions in different substandard situations also means less downtime, costs, etc. 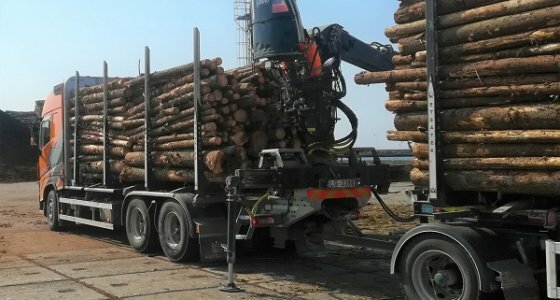 The more efficiently the transport service provider works, the more competitive and high-quality service it will be able to offer to LVM and LVM, in turn, to its customers – Latvian woodworking companies. Since its foundation in 1999, Joint Stock Company “Latvia’s State Forests” implementing sustainable forest management has paid one billion euros to state and local government budgets. LVM’s economic activities are carried out by maintaining and recovering forests, taking care of nature conservation, recreation opportunities and increasing timber volumes, as well as investing in expanding the forestland and developing forest infrastructure – renovation of drainage systems and forest road construction. The volume of timber in the forests managed by LVM increases by 12 million cubic metres annually.